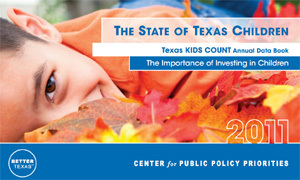 On February 4, the Center for Public Policy Priorities (CPPP) released the 18th annual Texas KIDS COUNT data book, The State of Texas Children 2011. The annual data book and free data warehouse provide the latest look at more than 80 different measures of child well-being in Texas and every county in the state. A new mobile site, www.tkcmobile.org, provides easy access to county-level KIDS COUNT data on the go. Download a pdf or order a hard copy of the data book. This year, the opening essay, "Show and Tell: The Importance of Investing in Children," explains why it is so critical to invest in children now to guarantee a strong return for Texas’ future. Download or order a hard copy of the state data book and essay. View more than 80 measures of child well-being for your county. o Maps that show how children are faring across the state. o Graphs to show change over time. o Use these images in your presentations or reports. o Share content via Twitter, Facebook, Digg, and other social networking sites. View one county’s snapshot of 18 measures of child well-being. Compare one measure across multiple counties. Access anytime, anywhere at www.tkcmobile.org .